Simple Water Boost Micellar Facial Gel Wash with micellar cleansing technology to gently yet effectively cleanse your face, removing dirt and make-up. No over-drying or feelings of tightness. Instantly restores hydration to dehydrated skin. Lightweight gel formulation glides onto skin, leaving it feeling refreshed, silky and smooth. Skin feels supple and comfortable after use. Contains no harsh chemicals, artificial colours or perfume, making it perfectly suitable for dehydrated, dry or sensitive skin. 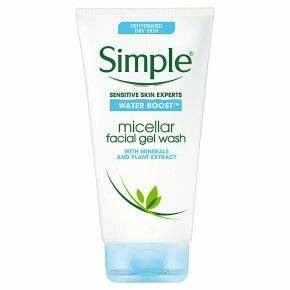 Introducing new Simple Water Boost Micellar Facial Gel Wash, a new generation face wash with Micellar technology, infused with skin-essential minerals and plant extract, this formula delivers instant hydration AND gentle yet effective cleansing - perfect for even sensitive skin.Cleansing is an important part of a healthy skincare regime. However some cleansers and face washes are harsh and can strip away natural oils from the skin, making it dry and dehydrated. Simple Water Boost Micellar Facial Gel Wash has a light, hydrating water-gel formulation and is specially designed for dehydrated, dry or sensitive skin to gently and effectively cleanse while leaving skin feeling supple, comfortable and instantly refreshed. No over-drying or feelings of tightness ! Lightweight on your skin, our micellar cleansing bubbles glide over your face, attracting make-up and dirt to gently yet effectively cleanse and refresh your skin. Infused with skin-essential minerals and a plant extract, this Simple Water Boost Micellar Facial Gel Wash instantly re-hydrates your skin, leaving it feeling soft, smooth and hydrated. As per all our Simple products, Simple Water Boost Micellar Cleansing Water contains no harsh chemicals, artificial colours or perfume, making it perfectly suitable for dehydrated, dry or sensitive skin. Simple Water Boost Micellar Facial Gel Wash is part of the new Simple Water Boost skincare range, specifically dedicated to reversing the 5 signs of dehydration: dryness, roughness, feelings of tightness, dullness and dry dehydration lines; to leave skin revitalised, supple and dewy fresh. Why not try out our other products in the Simple Water Boost range to help keep your skin hydrated? After cleansing with Simple Water Boost Micellar Facial Gel Wash, we recommend applying Simple Water Boost Hydrating Booster all over your face to instantly moisturise your skin and help it stay hydrated for longer. Finish with Simple Hydrating Light Moisturiser to complete your hydration skincare routine. WARNING: AVOID GETTING INTO YOUR EYES.